How to make fresh flowers last longer is a question I’m always asked. Well, here’s the answer. Follow these 8 tips and your flowers will flourish for longer than you ever imaged. Always use a squeaky clean vase. A quick swill after the last lot died isn’t enough. Bacteria builds up inside vases and if it’s not killed, it will shorten the life of the next beautiful bunch. If your vase is dishwasher safe, put it in and job done! Otherwise use hot water and a splash of bleach, soak for five minutes, then use a brush to get rid of the grime. If you can’t get a brush in there, buy yourself a little tub of ‘magic’ copper balls for around £6 (Lakeland sell these). Tip them into the vase with a little soapy water, swirl them around and they’ll remove the residue without damaging your vase. This is a vital step, so don’t skip it! Conditioning is the process of removing leaves, thorns and buds that will be below the water line, leaving just bare stems. Any leaves below the surface will rot and contaminate the water, blocking a flower’s water-carrying cells, preventing them absorbing properly. Conditioning also allows each stem’s energy to be diverted into opening the flower head, instead of feeding extra leaves. Use clean, sharp scissors, secateurs or knife, to remove everything from the bottom two-thirds of the stem. Re-cut about 2cm off the end of each stem at a 45° angle. This opens up the water-carrying cells and creates a larger surface area to take up water. 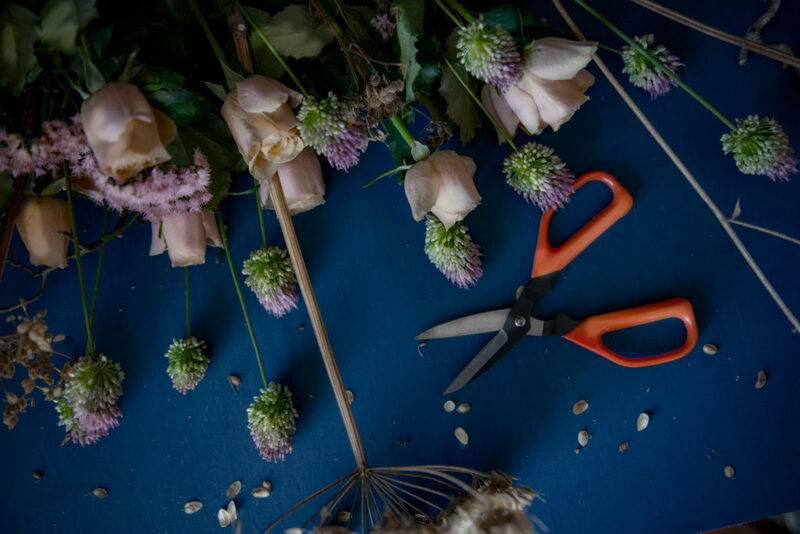 If your bouquet came from a florist, they will have done the conditioning already, so just leave the tie intact, re-cut the stems and you’re good to go. Flowers bought loose or from supermarkets might not have been conditioned, so check first. Some flower heads can be heavy, so choose a vase that will support a least half of the stem length, otherwise gravity will do its thing causing some flowers to bend and snap. Too short a vase will also make your arrangement top-heavy and more likely to topple. If you don’t have a tall enough vase, cut your stems down to size or add some sturdy twigs/foliage to lean heavier heads against. If your vase is too big, try this florists’ trick: fill it with water (see tip 5 below), then push some clear cellophane (or any clean plastic bag) under the water till any bubbles stop. This creates a false ‘base’ so shorter stems can just rest on top of the cellophane. Give your blooms room to breathe, by not overfilling your vase. This allows ventilation between each flower, stopping mould forming. If you’ve got too many flower for one vase, lucky you! Find another, split the bunch and get two bouquets for the price of one. Not using flower food is probably the biggest mistake people make when buying flowers. You wouldn’t last long on water alone, so don’t expect your flowers to. The ingredients in flower food have two purposes; firstly to feed the flowers and secondly to retard bacteria and fungal growth. Use the sachet that comes with your flowers and dilute it according to the instructions on the packet for maximum vase life. If you have flowers regularly, buy yourself a stock of sachets so you always have some to hand. Your local florist should stock these. Even with all the above steps, your water will still get murky eventually. Top it up every day and change it completely every 2-3 days and clean your vase again too. To keep the design intact, lift out the whole bouquet in one go and place it gently on its side, while you clean and refill the vase, including flower food again. Re-cut the stems and replace the flowers. All plant material gives off ethylene gas as it ripens, including fruit and flowers. The more ethylene present in the air, the quicker your flowers will ripen, fade and die. A fruit bowl nearby will significantly up the ethylene content so keep your bouquet away from bananas in particular. Keeping your flowers where there’s a flow of air will help disperse ethylene and slow down their ripening. A cool spot out of direct sunlight but away from strong draughts, heat sources and smoke is the best place. And that’s how to make fresh flowers last longer. Do all this and your bouquet will thank you for it. 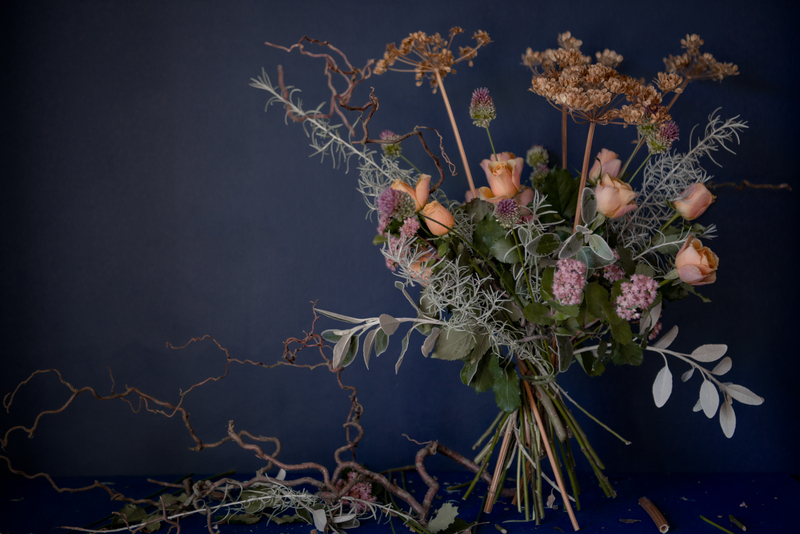 If you have any other cut flower questions, just drop me a line at hello@wildrosamund.co.uk.